Recreational users of public lands can cause a myriad of biophysical impacts ranging from effects on soil, vegetation, water, and wildlife (Hammitt, Cole, and Monz 2015). Recreational users can also impact other users’ experiences. Agencies often use indirect techniques such as education to prevent or reduce impacts (Dawson and Hendee 2009; Marion and Reed 2011). If indirect techniques do not work, agencies may develop rules governing recreational use. In tracing the history of public land management agency efforts to reduce recreation impacts, McGivney (2003, p. 21) asserts that historically, land managers’ educational messages varied from agency to agency and even within an agency from district to district. “The lack of a uniform message led to confusion among wilderness users and, in many cases, made the land manager’s dual job of recreation enabler and environmental steward that much more difficult.” Over time, agencies have made concerted efforts to develop consistent educational messages, most notably by partnering with organizations such as the Center for Outdoor Ethics that administers the Leave No Trace Program. Leave No Trace (LNT) is a set of seven principles that guide recreational users in the outdoors. The LNT principles are based on physical, biological, and social science research (LNT 2017a). The principles are designed to be flexible; recreational visitors must still use site and situation specific judgment when it comes to applying the principles when recreating (Marion 2014). Over time, the LNT principles have become ubiquitous throughout public land management websites, kiosks, permits, and pamphlets. Agencies instruct recreational visitors to follow regulations as well as LNT principles. For example, the San Juan National Forest directs users to “Please follow regulations associated with wilderness areas and always use Leave No Trace techniques to help keep these areas wild, clean, and pristine” (San Juan National Forest 2018). Likewise, LNT notes that their guidelines do not supersede agency regulations; for example, the LNT website advises users to “Check regulations, but camping 200 feet (70 adult steps) from water is a good rule of thumb” (LNT 2017c). When LNT is referred to on agency websites, it is often linked directly to the LNT website (LNT 2017b), which lists the seven principles and specific guidance under each principle. 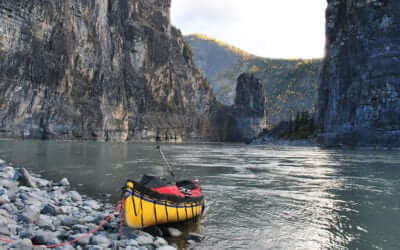 This research study is designed to look at the congruence between USFS rules in wilderness and LNT principles for one of the seven principles – “travel and camp on durable surfaces.” Specifically, the research looks at one component of the “camping on durable surfaces” guidelines – the camping distance from waterbodies. This principle was selected because campsite setbacks from water are among the most frequent rules governing recreation (Cole 1989). More recently, Griffin (2017) found that camping rules – typically setbacks from water or trails – were one of the most common rules managers had enacted throughout the National Wilderness Preservation System. Recreational users prefer to camp near water bodies for both practical and aesthetic reasons (Cole 1989; Lucas 1990). When Lucas (1990) surveyed 785 wilderness users in Montana about their reasons for rejecting particular campsites, high on the campers list was that prospective campsites were perceived to be “too far from water.” Leave No Trace recommends campers maintain a 200-foot (61 m) setback from waterbodies to minimize biophysical or social effects (LNT 2017b). In a survey of visitors to eight wildernesses, Christensen and Cole (2000) found that most visitors preferred to camp within 200 feet of a waterbody, the distance recommended in the LNT guidelines. Wilderness managers have historically and frequently reported that there are camping-related impacts near lakeshores (Washburne and Cole 1983). This perception has led land management agencies to develop camping setbacks from waterbodies (Cole 1982). Cole (1989) reported that camping limits near waterbodies were among the most common rules agencies had enacted, with 200 feet being the more frequent setback. Since 1982, USFS publications for wilderness recreators have recommended campers maintain a 200-foot setback from waterbodies (USFS 1982). Lucas (1990) advocates explaining to visitors the reasons for maintaining a camping setback from waterbodies. The rationale in the 1982 publication for setback was for social reasons (e.g., feeling of solitude) rather than biophysical impacts. Cole’s (1989) research supports that water setbacks are mainly used for social rather than biophysical reasons (e.g., causing water pollution or impairing animals’ use of natural sources of water). Indeed, Cole’s 1982 research did not find much difference in biophysical impacts from campsites located closer to and farther than 200 feet from lakeshores. Regardless of the reason for the setback, Christensen and Cole (2000) found that asking campers to move farther back from lakeshores was more successful if the reason given was for ecological rather than social reasons. This study is not designed to provide social or biophysical research to support waterbody setbacks in wilderness. Instead it looks at the level of congruence between the LNT recommended 200-foot setback and current USFS setbacks from waterbodies. In addition, three other variables are examined to explore whether the presence of setbacks or the setback distance are related to the size, age, or region of the wilderness. The source of the USFS rules for this research project is Wilderness Connect (www.wilderness.net), the interagency database of wilderness policies and related regulations. The database has information about each US federally designated wilderness including rules and policies regulating recreational use. The “Area Management” tab for each USFS wilderness was analyzed to determine if it had a rule about camping proximity to waterbodies. USFS rules about camping setbacks from waterbodies are grouped into four categories: lakes and ponds, rivers and streams, springs, and the generic term “water.” Each of the rules were recorded using two criteria: (1) presence of a rule about camping next to waterbodies, and (2) the setback distance. Because rules sometimes varied between different types of waterbodies within the same wilderness, distances were recorded separately for rivers and streams, lakes, springs, and water. The database is not without its shortcomings. 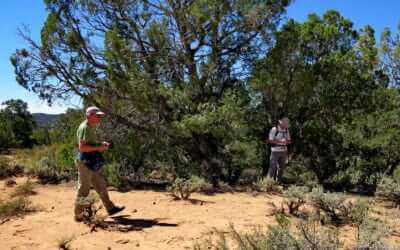 Some agencies provide more information about wilderness rules. The research was restricted to the USFS because the dataset is more complete than it is for the BLM-, NPS-, or USFWS-managed wilderness areas. Another shortcoming of the database is if rules are absent, it is difficult to know if rules do not exist or if the information was simply not entered Wilderness Connect. Of the 445 USFS-managed wildernesses, 112 had water-related camping setback rules. The Rocky Mountain Region had the highest percentage of wildernesses with water setbacks (Figure 1) as well as the most wildernesses that have water setbacks for camping (n=36). Figure 1 – Percentage of USFS wildernesses with and without camping setbacks from a waterbody by USFS region. Figure 2 – Percentage of USFS wildernesses with and without camping setbacks from a waterbody by wilderness size. Wildernesses designated in the last 18 years are less likely to have water-related camping setbacks than older wildernesses (Figure 3). This may be due to the fact that when a wilderness is designated there are few, if any rules but as problems develop over time, managers may add rules; thus, the older the wilderness, the more likely it is to have rules. Figure 3 – Percentage of USFS wildernesses with and without camping setbacks from a waterbody by date of congressional designation. 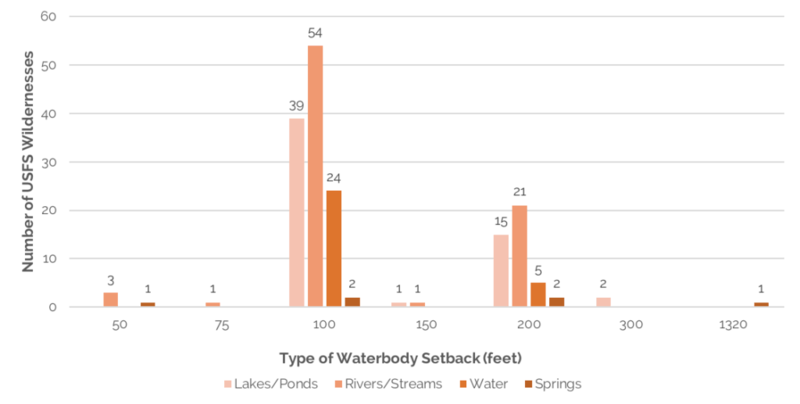 Figure 4 – Number of USFS wildernesses with camping setbacks by type of waterbody. Figure 5 – Distance of the camping setbacks from waterbodies in USFS wildernesses. USFS with water setback distances varied from 50 feet (15 m) to 1,320 feet (402 m). The most common rule about setback distances for waterbodies in USFS wildernesses is at least 100 feet (30.5m) from waterbodies (Figure 5). Most (73%) of the USFS camping setback rules from water were less than the LNT guideline of 200 feet. There are regional differences in terms of the setback distance from waterbodies (Figure 6). 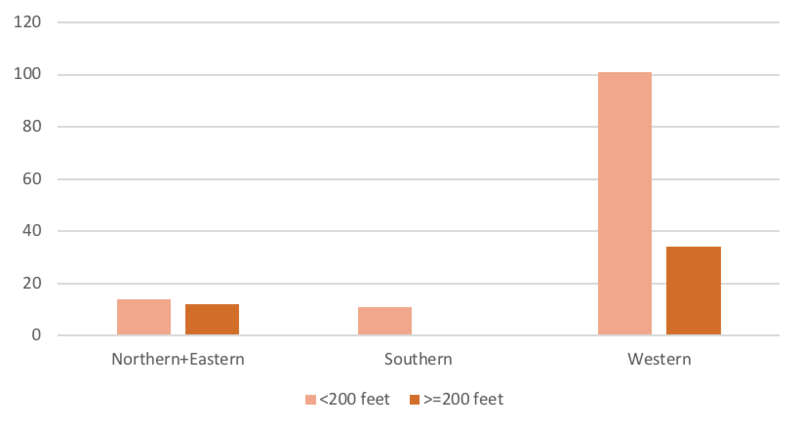 Compared to the LNT 200-foot setback guideline, none of the Southern Region’s wildernesses meet or exceed the guideline, 25% of the Western Region (all regions except the Northern, Eastern and Southern) meet or exceed the guidelines, and 46% of the Northern and Eastern Regions meet or exceed the LNT guideline. 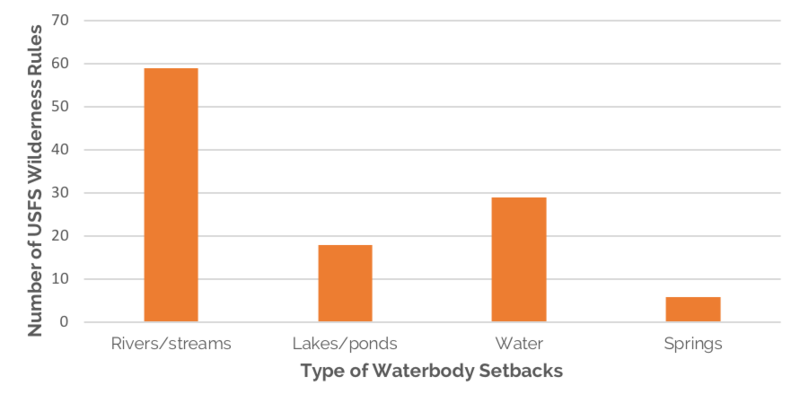 Figure 6 – Regional differences in the camping setbacks from waterbodies in USFS wildernesses. Setback distances almost certainly predated wilderness designation in some forests. 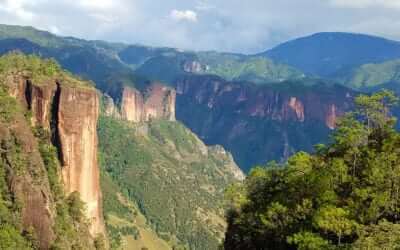 The camping setbacks were and are based on general or site-specific research, biophysical factors (e.g., a lake may be surrounded by mountains), social science research, and political acceptability. In his research in the 1980s, Cole (1989) reported the most frequent setback in USFS wildernesses was 200 feet. This matches the USFS recommendations from 1982 as well as the LNT guideline. Today, the typical setback in USFS wildernesses – if one exists – is 100 feet from waterbodies. One of the keys to LNT’s efforts – which if adopted by users can avoid regulation – is consistently using the same message (Marion and Reed 2001). The LNT messaging appears to be internally consistent (this author has never encountered any deviation from the LNT recommendation of 200 feet whenever LNT is cited), so that does not appear to be an issue. A study by Leung and Marion (2000) may suggest that the LNT messaging campaigns are working. They studied seven wilderness areas in the eastern United States that did not regulate camping distance from waterbodies. They found that 70% of the 118 campsites were more than 200 feet from water in accordance with the LNT guidelines. The purpose of the Leave No Trace Program is to minimize the impacts of recreational use on public lands, a goal that federal land management agencies support. The memorandum of understanding signed between the agencies and the LNT Center has resulted in the widespread agency dissemination of the LNT principles. Consistent messaging is key to public acceptance and use of the LNT principles. The more the public accepts and uses the LNT guidelines, the less likely it is that agencies will need to develop recreation-related rules in wilderness. If the seven principles were universally used, the need for regulation would arguably be less. Even with LNT principles, agencies may still need to adopt recreation-related rules in some wildernesses. There are times when the USFS may need to develop rules that deviate from the LNT principles. This research has identified a disconnect between LNT guidelines and USFS regulations when it comes to setback distances from waterbodies, with most of the USFS setbacks being closer than the LNT guidelines. The time is ripe to explore ways to achieve greater consistency between agency regulations and LNT principles. Christensen, N.A., and D. N. Cole. 2000. Leave No Trace practices: Behaviors and preferences of wilderness visitors regarding use of cookstoves and camping away from lakes. In Wilderness Science in a Time of Change Conference – Volume 5: Wilderness Ecosystems, Threats, and Management, May 23–27, 1999, Missoula, MT, comp. D. N. Cole, S. F. McCool, W. T. Borrie, and J. O’Loughlin (pp. 77–85). Proceedings RMRS-P-15-VOL-5. Ogden, UT: U.S. Department of Agriculture, Forest Service, Rocky Mountain Research Station. Cole, D. N. 1982. Wilderness Campsite Impacts: Effect of Amount of Use. Res. Pap. INT-284. Ogden, UT: USDA Forest Service, Intermountain Research Station. ———. 1989. Low-Impact Recreational Practices for Wilderness and Backcountry. Gen. Tech. Rpt. INT-265. Ogden, UT: USDA Forest Service, Intermountain Research Station. Griffin, C. B. 2017. Managing unconfined recreation in wilderness. International Journal of Wilderness 23(1): 13–17. Hammitt, W. E., D. N. Cole, and C. A. Monz. 2015. Wildland Recreation: Ecology and Management. Hoboken, NJ: Wiley Publishing. Leave No Trace. 2017a. Retrieved December 16, 2017, from https://lnt.org/learn/science-behind-principles. ———. 2017b. Retrieved March 17, 2018, from https://lnt.org/learn/7-principles. ———. 2017c. Retrieved March 17, 2018, from https://lnt.org/learn/principle-2. Leung, Y., and J. L. Marion. 2000. Wilderness campsite conditions under an unregulated camping policy: An eastern example. In Wilderness Science in a Time of Change Conference – Volume 5: Wilderness Ecosystems, Threats, and Management, May 23–27, 1999, Missoula, MT, comp. D. N. Cole, S. F. McCool, W. T. Borrie, and J. O’Loughlin. (pp. 148-152). Proceedings RMRS-P-15-VOL-5. Ogden, UT: U.S. Department of Agriculture, Forest Service, Rocky Mountain Research Station. Lucas, R. C. 1990. How Wilderness Visitors Choose Entry Points and Campsites. Res. Pap. INT-428. Ogden, UT: USDA Forest Service, Intermountain Research Station. Marion, J. L., and S. E. Reid. 2001. Development of the U.S. Leave No Trace Program: An Historical Perspective. January. Retrieved from https://lnt.org/sites/default/files/Leave_No_Trace_History_Paper.pdf. McGivney, A. 2003. Leave No Trace: A Guide to the New Wilderness Ethic, 2nd ed. Seattle: The Mountaineers Books. San Juan National Forest. Retrieved March 17, 2018, from https://www.fs.usda.gov/recmain/sanjuan/recreation. U.S. Department of Agriculture, Forest Service, Inter-mountain Region. 1982. Leave No Trace: A Program for Teaching Skills to Protect the Wilderness Environment. Ogden, UT. Washburne, R. F., and D. N. Cole. 1983. Problems and practices in wilderness management: A survey of managers. Res. Pap. INT-304. Ogden, UT: U.S. Department of Agriculture, Forest Service, Inter-mountain Forest and Range Experiment Station.